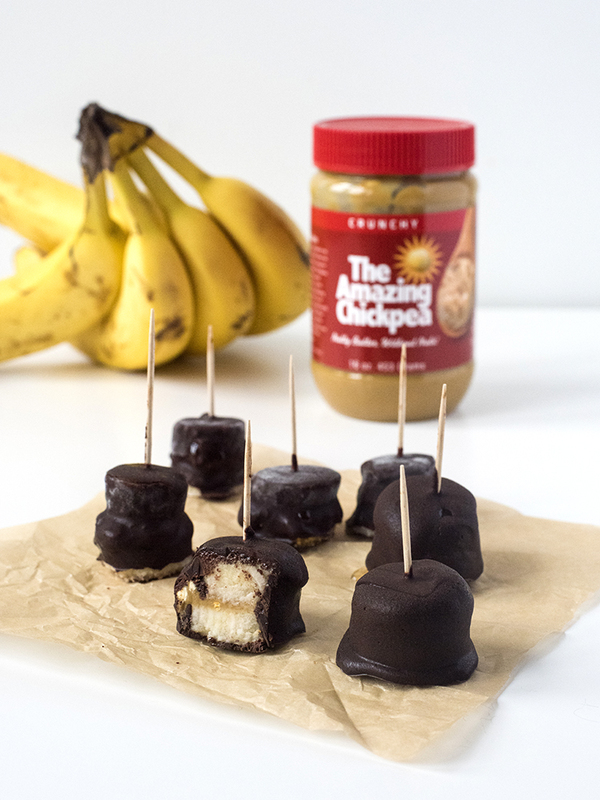 Frozen Banana Pops are the perfect snack to cool you down on a warm summer day, and a great healthy alternative to ice cream treats! Your kids will love these. Start by peeling and cutting the bananas into thick chunks (the thickness helps the bananas hold up to the chickpea butter). Using a knife spread the chickpea butter onto top of a banana chunk then add another piece on top to make a sandwich. Place a toothpick into each sandwich then transfer to freezer where they will need to sit for an hour. While you are waiting for the pops to freeze start making the chocolate sauce over the stove. The sauce will require a double broiler system which you can create by filling a pot halfway with water and placing a glass mixing bowl over the top (make sure it fits snug so the chocolate melts evenly). Microwave the coconut oil until it becomes a clear liquid which can be added to broiler along with chocolate chips. As the water boils stir the chocolate mixture until melted. Once completely melted, add the vanilla and mix again. After the banana pops have been in the freezer for an hour, take them out and cover them in chocolate sauce then place them on cookie sheet. The pops are now ready for the last freezing stage which takes a couple hours, but don’t worry it’s worth the wait! These pops are the perfect healthy sweet treat during any heat wave.